The virtualization agent mechanism is an agent that is installed inside the virtual server and typically provides load-enhanced drivers for the virtual servers to add various types of common functionality, synchronization of the date and time of the virtual server to the host, and securing of communication between the virtual server and hypervisor. Its installation can be automated as part of the operating system deployment or virtual server provisioning process, or it can be installed at a later time. A virtualization agent is capable of generating heartbeat messages (or heartbeats). In virtualized environments, a heartbeat is a message that is sent from one party to another to ensure that the sender is operating normally. Figure 1 shows virtual machines with virtualization agents that communicate with the host hypervisor. 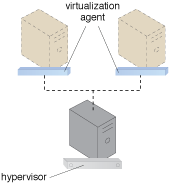 Figure 1 – Virtualization agents installed on virtual machines communicate with the hypervisor.